For some people, brushing in the morning is a breeze. It’s a great way to wake up and confirm that your breath is smelling fresh. Many people only brush in the morning for the sole reason of keeping fresh breath. However, when nighttime rolls around, it’s easy to jump into the bed without even turning the bathroom light on, especially if you’ve had a long day. However, skipping your nighttime oral care is arguably worse because of how vulnerable you are to bacteria while asleep. Bacteria will begin to eat away at the food particles still stuck in your teeth. Plaque will begin to harden into its calcified form known as tartar, making it impossible to remove at home. If you struggle to brush before bed, try wearing headphones and listening to your favorite music or podcast while brushing. This will help past the time and take your mind off brushing. No matter what toothbrush you buy, it won’t be able to remove plaque from the sides of teeth or the deep gum pockets in between them. For this reason, it’s essential that you floss at least once a day, ideally right before bed. Failing to floss daily will only increase your risk of developing yellow teeth, tartar buildup, bad breath, and cavities. If this is difficult, consider purchasing floss picks or a handheld floss holder. These devices are perfect for people with limited dexterity or physical impairments that make flossing nearly impossible. If you struggle to pay for preventive visits, consider asking your dentist about financial plans they offer or dental discount plans to make care more affordable. 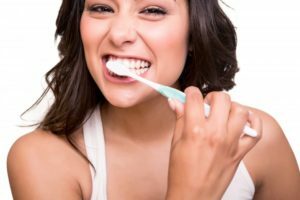 Have more questions about improving your daily oral care habits? Schedule an appointment with your dentist today! Ever since Dr. Joy Todd earned her dental degree from the University of Kentucky, she’s been very happy to build relationships with the community and provide exceptional dental care to patients of all ages. To learn more about her practice or tips on oral care, contact her through her website.